thebahamasweekly.com - BE SEEN, unlike anywhere else through The Bahamas Weekly! BE SEEN, unlike anywhere else through The Bahamas Weekly! Become a Gold Marketing Member on The Bahamas Weekly for MAXIMUM Exposure! The Bahamas Weekly provides a venue for you and/or your business to been seen unlike anywhere else on the internet! As a major hub of information on Events, Entertainment, Sports, Community, News, Arts & Culture, Fashion, with over 20 Columnists, we are the portal for you to be seen. 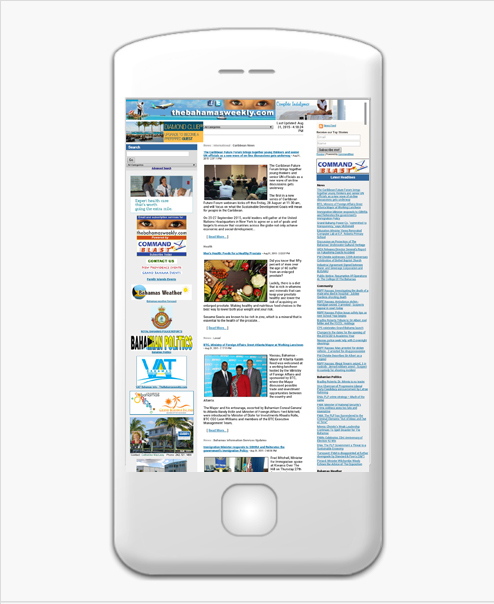 The Bahamas Weekly has fast become THE website to keep your eyes on, as our website is updated continuously throughout the day and night, and people love to check us often for what's going on throughout The Bahamas. We average over 7 million hits monthly. 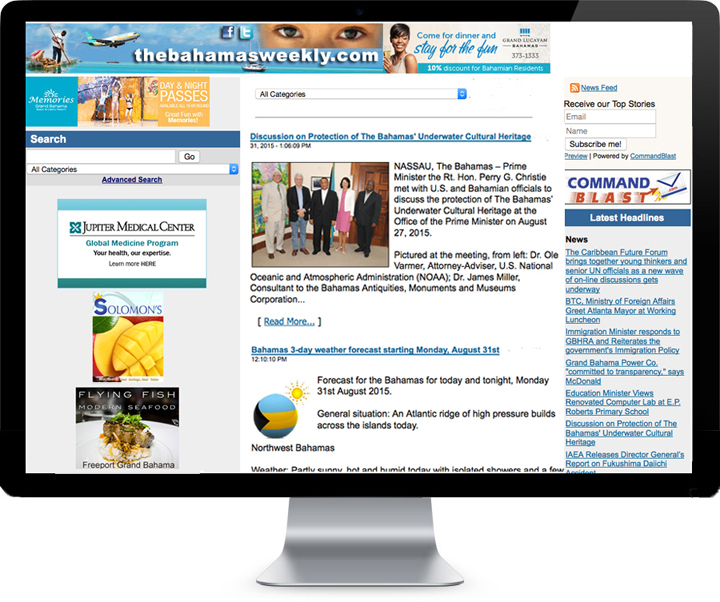 Many set The Bahamas Weekly as their home page to ensure they do not miss a thing! TheBahamasWeekly.com is here to serve the community of The Bahamas. We provide a venue for Bahamians to feel connected to one another no matter what island of this archipelago they live on, or even if they now live abroad. TheBahamasWeekly.com is based from Grand Bahama and started in October 2006 as a national expansion to a Grand Bahama-based website which began in 1997. The Bahamas Weekly is updated throughout the day with fresh content ranging from news, sports, arts and culture, entertainment, events, sales and promotions, interviews, and more. Our weekly E - News Feed (top 70 articles of the week) goes out each Friday reminding our viewers to view our content again and again. Our articles are well saturated in search engines like Google so our content is easily found and lives on. Our subscribers are Bahamians living in The Bahamas or abroad, as well as anyone with an interest or affiliation to The Bahamas. We have many international subscribers. Subscribe today! We offer three Event Calendars for Grand Bahama, New Providence, and the Family Islands. Find out what is going on! Advertise with The Bahamas Weekly and be seen! The Bahamas Weekly is fast becoming the leading daily viewed website in the country, and an amazing portal for advertising. Do you have your products or services listed with us? What are you waiting for? We offer cost effective full colour ads, printable coupons, attachments, your own category, links to your own website or information, animated moving ads, and we can even create radio or TV commercials to be streamed on our website. Online advertising IS the future! Be seen on each and every of our pages with our banner-ads - that's over 45,000 pages! Let TheBahamasWeekly.com bring you to the WORLD! Here's how you can take advantage of our services. Our Gold Marketing Members, those you see on our left column have the luxury of being seen on each and EVERY page of our website, and currently that is over 40,000 pages! We don't just put an ad up for you on one obscure page that you have to be "lucky" to find - we expose you on every page! With your Gold status on The Bahamas Weekly it's like being seen on EACH and EVERY page of a traditional newspaper, BUT a newspaper with over 40,000 pages! Not only do our Gold Members have maximum exposure, but they have the ability to post one article/ad per week on our website! And these articles go into a custom area on The Bahamas Weekly whereupon anyone can find out about your business either by linking directly to your website, or by clicking from one article to another about your business, sales or services. Because TheBahamasWeekly.com is an information driven medium, persons in search of our news content through Google, Yahoo, Bing and other search engines will see your promotions without specifically requesting or looking for it! This is because your banner advert would appear on each of our over 45,000 pages (and counting) on the web. Our rates are great! And we're fast - we can have your business logo/ad up usually within a day. • Contact us to find out information on our Gold, Gold Plus and Platinum membership packages. • Note, Custom Membership packages can be created to meet special requirements. Email us for more information or to request our rate seet at Sales@thebahamasweekly.com or call (242) 352-2988 . Please add us to your Media List. We want to hear your news and receive your press releases. We reserve the right to edit or decline content. Community: Editor@thebahamasweekly.com Are you part of a non-profit group? Need support with getting the word out about your organization? We are here to help! We provide special service to Community groups, so contact us to find out more. TheBahamasWeekly is committed to Giving Community a Voice! Press Release assistance: pr@thebahamasweekly.com Need help with writing a press release? Contact our team if you need help with Press Release creation, and/or Media Mail-out to all local or national media within The Bahamas. Need help getting your Press Release to another country? We can help with that too. Opportunities: opportunities@thebahamasweekly.com Are you holding Auditions or Castings? Have a Job Offering? We provide a FREE service for these types of community related events or to enhance our work force. Write us and let us know all about it. Event Calendars: See our Event Calendars for New Providence, Grand Bahama and the Family Islands.Text listings on any Event Calendar is FREE. Have your event poster featured on an Event page, for only $50/week. Be sure to get the most out of your event by posting with us,or check out our calendars for conflicting events. Email: Editor@thebahamasweekly.com to be included. Weekly News Updates Signup: Let us come to you! Our content increases DAILY. Allow us to send you our Weekly News Updates. Please note that your email address will never be disclosed or sold. Subscribe today at the top of our website. The Bahamas Weekly's 'Sound of Savings' Promotion!